By Abi - Bolivia - 15 Jun/03 - Viewed 1659 times. We arrived in Puno, Peru and signed up for a two day tour of Lake Titicaca and some of its islands. We boarded our small boat with a group of about 20 and headed to Uros Islands, a group of floating islands made out of tratora reeds. They harvest the reeds, and they last for 3 to 4 weeks, before they have to put more reeds on top of the rotting ones. This island was fascinating because they use the reeds for almost everything: houses, school, floor, boats, you can even eat part of it. (which we tried and tasted sweet). We took a ride on one of the reed boats. It takes 2 people a month to construct one of the boats, which lasts for nearly a year. After visiting Uros, we were on our small motor boat for about 3 hours before reaching Amatani. We were told we would be staying with a family, which I was really looking forward to. I was under the impression that all the islands we would visit would be built out of the reeds, but no such luck. We arrived at Amatani, and were greeted by some locals, where we were divided up among the families. A girl took us to our host family and we were shown to our room, but not greeted by the lady of the house. The door to this room was half size, and both Travis and I had to bend down to enter it. His head almost touched the ceiling. It had four beds, but we were the only visitors. After we dropped our stuff, I asked if we could help but were told we couldn't do anything. Finally we were served lunch, alone, which I thought was odd, as I figured we would be eating with the family. We met up with the group after lunch to hike to a temple still used today by the locals. We got some history of Lake Titicaca (which means Gray Puma in the Quechua language). Legend has it that you are supposed to leave all negative energy at the gate, make your wishes known to the gods and walk around the temple three times to have them come true. We returned to the main square and the locals were performing a traditional dance (complete with special dresses) as part of a celebration for Pentecost. One of the daughters from our family waited for us and took us back to the house for dinner. Along the way, I tried to ask her some questions, but could only get a yes or no out of her in response to each thing I asked. When we arrived, I asked if we could eat with the family. There was about a minute discussion in Quechua of whether or not they would eat with us. Finally they said yes and dinner was at 7:00. The mother and one of the daughters joined us, but we quickly discovered that the mother didn't speak Spanish. So much for dinner conversation! The whole situation was quite uncomfortable and we were glad to leave the next morning! We loaded up on the boat and went to the next island, Taquile. The guide took us to the main square, where there was only a church and two stores to examine. Then we arrived at our lunch spot and had a short lecture about the locals dressing habits. The men wear certain hats depicting their marital status. If they are married, it is a certain kind, accompanied by a bag/purse carrying coca leaves. When they talk to one of the other guys, they greet each other by exchanging the coca leaves. The single guys wear a different color of hat, and if it is flopped to the right, they have a girlfriend, and if it is flopped to the left, they are available. I guess it keeps everyone honest! The women have a shawl they wear with pom poms on the ends. If they hold one color in their hand, it means they are happy and the other means they are sad. I don't think I would enjoy letting the entire village know how I am feeling. We were interested in learning about the customs, but didn't really enjoy the time it took to go to all the places. I would have been content to check out the Uros island and skipped the rest. Maybe it was because I didn't really care about getting to know the people we were on the tour with, maybe it was the uncomfortable stay with the family, or the maybe it was the several hours on the motor boat! Perhaps the next part of the trip will be better. On our way from Puno, Peru to La Paz, Bolivia we had a two hour layover in Copacabana, Bolivia and went to see some ruins that we had just enough time for. It was 10 Bolivianos (a little more than $1) to view 3 different sites. As we just had a bit of time, the boy told us that we could see the one set of ruins for a tip. However, we had no local currency and only large bills of Peruvian Soles. We tried the Oreo cookies, which worked as he took us around and explained some of the ancient legends. One of them included the heart of a llama being taken out and placed in this small dip in the rock. There was a natural crevice and the theory was that if the blood flowed quickly, it would be a good harvest. If the blood congealed or flowed slowly, it would be a bad harvest. There was more, but this boy mumbled so much I couldn't get much more than that out of it. We made it back at the appointed time for the bus, which was supposed to be a 7 hour trip, but turned into 12 when we had to wait a couple of hours for a bicycle race going through town on the only road. All the people spilled out of the various buses to update their journals, chat with each other or read. Thankfully, it was a nice afternoon. We finally made it to La Paz and found a decent hotel. The next day we got up late and ran some errands, first and foremost being our Brazilian visa. This is the only country that requires an extra visa, so we wanted to get that paperwork done in plenty of time. We discovered that there are several requirements including an original and copy of yellow fever vaccination, return ticket leaving Brazil, copy and original of credit card (proving you had enough money to stay there), 3x4 photo, and a $100 fee per person, plus a lengthy form to fill out. The visa is free, but there is a $100 processing fee for reciprocity that the USA charges Brazilians trying to enter our country. Of course our yellow fever vaccination card was with our other documents that had been taken in Ecuador, so we had a little more to do than most travelers. First, the bank that we had to pay the fee to was only open from 9 to 1. The office we had to go to get an original yellow fever vaccination and pay almost $10 each was only open from 8 to 11:30 a.m. and the embassy closed at 2:00, so we were out of luck for the day. We grabbed lunch and filled out the form, making a list of the things we needed to do early the next morning. We took the afternoon to figure out the different things La Paz had to offer and decided on a three day ice climbing hike for something different. Luckily we were able to accomplish everything we needed to by about 10:30 the next morning and headed out for the afternoon to a place called Valle de Animas. It was about an hour by bus and the driver told us to walk up the road for about 15 minutes. We saw a barbed wire gate, which a passerby told us was the "Road of Death". We continued on and saw another path and asked a truck passing by if this was the right place. He said it was on up farther and to hop in. He gave us quite an exciting 15 minute ride and let us off, saying the Valley was just ahead. We decided to ask some local construction workers who told us we were all the way past it and it was back the way we came from. A little frustrated, we started walking back the way we came, as no vehicles were in sight. Fortunately a dump truck came by and gave us a lift, but took us all the way back to where the bus left us and wanted payment for the trip. We found another dump truck going the opposite way and got him to take us back to the path we had originally found. He also wanted a payment, which I found odd, given that we were hitchhiking! A lot frustrated by this time, we decided to ask some people that lived right near this path, but nobody seemed to know what we were talking about. They told us it was an hour up the road! We ended up just walking down this path to see what there was and found a canyon that was neat, but opened up just a little way in. Then we walked down to the barbed wire gate to the Road of Death. We figured it couldn't be too bad, we could always turn around and the guy was probably pulling our leg. It was an amazing place as the walls of this canyon were extremely narrow. We took one path for about 15 minutes before we couldn't go any farther. The neat thing of it was that it wasn't just one huge rock that was separated, but actually a mixture of small rocks and dirt keeping it together. It seemed like a jenga game, where if you take one of the rocks out, everything would come tumbling down, but I tried it (in an open area) and it was very solid. Later, when we got back into the city, we found an agency that offered trips to the Valley of Animas with some incredible pictures. We never found that, but enjoyed the afternoon anyway! The next morning, we met our group (4 Israelis, 2 Germans, 1 Swede and ourselves) for our 3 day ice climbing hike. First, we got outfitted in all of our gear: boots, ice crampons, ice axe, extra gloves, fleece, jackets, etc. and then hopped in the Land Cruiser for our hour journey to the Refugio where we would stay the first night. After lunch, they took us for training to a nearby glacier. We learned how to walk on the ice with the crampons, use the ice axe and the proper way to take a rest when we were on the hardest part, the 65 degree climb to the summit. One of the practice climbs was an 85 degree wall of ice. We were tied in with a rope, but it was extremely difficult to get the axe to stick in the ice far enough to hold your weight. We also practised on another section similar to what we would encounter at the summit and it was more difficult to come down than to go up. We would always have the rope for safety, but there would be four times on the return where we would have to wait for the guide to hammer in the spike to secure the caribeaner and start the rope over again. I must admit I was a little nervous at what we had gotten ourselves into! The next morning we headed out to the base camp, a three hour journey, but halfway to the summit. We arrived in mid-afternoon and the guides used the ice axes to hack into the moutain for our tents. While the sun was out, it was actually fairly warm, but as soon as it went behind the mountain, it was extremely cold. Luckily our sleeping bags kept us warm enough and we all went to bed about 6 p.m. since we had to get up at 1 a.m. to begin the ascent. Unfortunately, I had an excrutiating headached all through the night, and the guides didn't quite get a level field for the tents. We kept rolling into the low side of the tent wall and got about an hour of sleep each. When they woke us up, all we had for breakfast was a tea, called mate de coca, which is helpful for any altitude problems you might have. The most important thing is your health and if there are any physical problems at all, such as headache, stomach pains or anything like that, you aren't allowed to climb as it can be very dangerous. The tea worked for me and I was able to continue on, but one of the Germans was having a few more problems and wasn't able to go. Each guide took 3 people, so we were locked in with the Swede, named Magnus and our guide, Choco. We were all roped together in a line and we started out with a full moon above us. After the first rest break, I was sure I couldn't go on. We had been told it was 7 hours to the summit and I just didn't think I could make it, but Choco told me it was only 4. That did wonders for my mind and we continued. The next part we came to included a ladder crossing a crevasse about 10 feet high and at a 65 degree angle. Just the day before, some Germans had purchased this ladder for them; previously they would pull you up by the rope The things the tour agency doesn't tell you when deciding on the treks you want to do! We used the ice axes for that part of the climb and I was excited when I got to the top of this section. I was looking forward to the summit. A few hours later, both Travis and I were freezing, to the point where Choco took off one of my boots and placed my frozen foot under his fleece to warm it up. When he tried to move my toes, it was extremely painful, but after about 10 minutes, the circulation returned and we continued. Finally, at about 6:30 we reached the place right below the summit, which was 5950 meters. 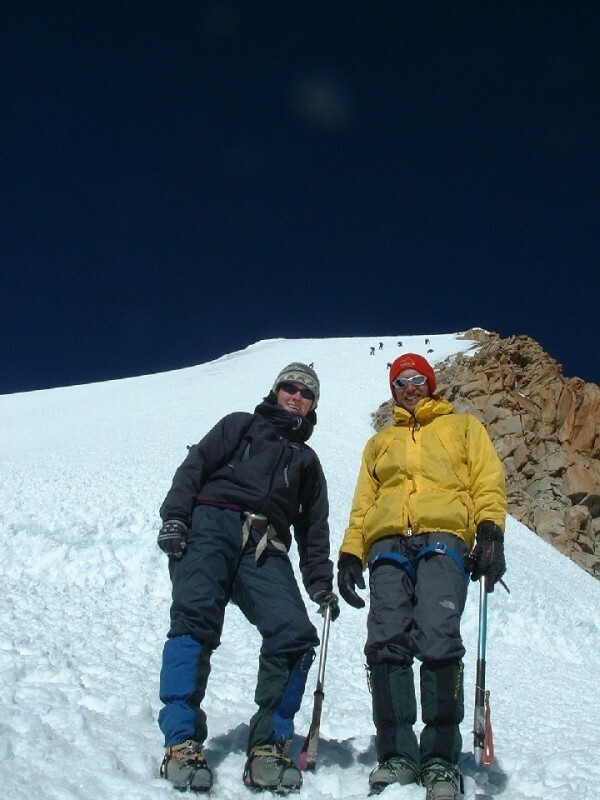 The summit is 6,088 meters, or 19,974 feet. Travis was still so cold, he couldn't hold his axe properly and couldn't feel his toes, even after the sunrise came and started to warm things up just a bit, so he decided not to continue. Magnus and I started out with Choco, but after about 100 feet, I knew I was too tired to continue. Especially looking up, it was so daunting. Choco set up the rope to rapel me down and I tied in with another guide. I was happy to have the rest and a little sorry not to have made it. We waited for them and after they returned in an hour and a half, felt rested enough to make the ascent. We didn't try to go for it, but perhaps with starting during the day with not so much cold (the heat can be a problem, and you have to start early enough before the snow starts melting and an avalanche is a possibility) and a proper meal to give us some energy, we could have made it. I really don't know how the rest of them did it. Oh well, it was an experience we won't soon forget! We made it back to the base camp by about 11:00, collected our gear and headed back to the Refugio. It was about 12 hours walking and we were exhausted by the time we arrived. One of the Israelis had blue toes and was looked at by a doctor on the premises and taken to a clinic. Fortunately, we had warmed up and our only complaints were sore bodies and exhaustion. We headed back into La Paz, but were told that there was a large fiesta/parade, with all of the main streets closed to traffic for this anniversary of the city. The driver tried to get as close as he could to our hotel, but we would be walking some more. Yeah, I haven't walked enough for one day! Anyway, one interesting thing was that you had to line up to cross the street. There were swarms of people and the people in the parade were dressed up in costumes, masks, accompanied by bands and ladies dancing the traditional Bolivian dance. We crossed the street and found our hotel's sign looming ahead right along the parade route. There was no other way for us to get there, but to walk against the parade, so we tried to be as inconspicuous as possible (Right. Magnus had joined us, so he had his backpack on, Travis' had his backpack, and I had my smaller daypack. Nobody noticed us at all!) We were able to get to the hotel and after a quick dinner, dropped into bed. Did we really sign up for that?